Animation matters. Animation shapes our lives and culture. Apparently, it influences our Chinese New Year cakes, too. 2008 is the Year of the Rat on the Chinese calendar. 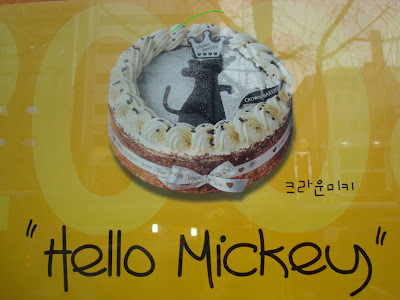 Crown Bakery, a bakery franchise in Korea, has created the "Crown Mickey" to celebrate the New Year. There is Disney influence all over this cake. Firstly, the name "Crown Mickey" directly refers to the worlds most famous mouse. Secondly, the design of the rat on the cake must be inspired by the Pixar film Ratatouille. Don't you agree? Here is the the neatest Disney influence. 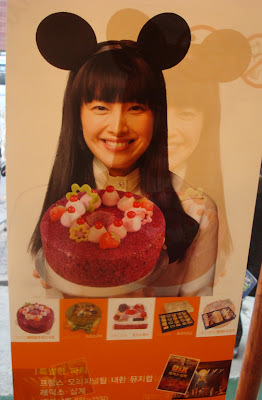 The cake advertisement features a young woman done up as Minnie Mouse. The Crown Mickey cake and it's advertisement draw heavily on Disney animation for inspiration. It proves that animation influences how we live, even if only in a small way. In this case, the cake we eat for the Chinese New Year. Update (January 15th, 2007): Whoa! Here is a very similar advertisement from Paris Baguette, a chief rival of Crown Bakery. I wonder which advertisement came first? 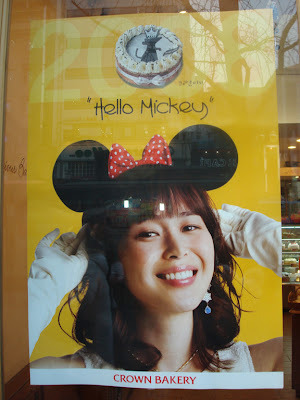 Don't forget Japanese influence on that poster as well... "Hello Mickey" sounds a lot like "Hello Kitty". Oh yeah! I didn't catch that one. Good observation. They are promoting Hong Kong DisneyLand by calling it the "Year of the Mouse".